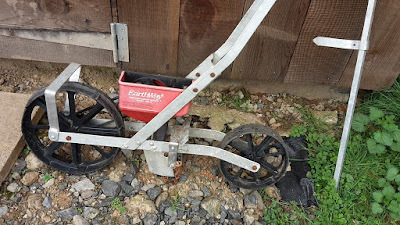 So I decided with all the planting I'm doing here and how the area is growing every year it was time to invest in some sort of a seeder. 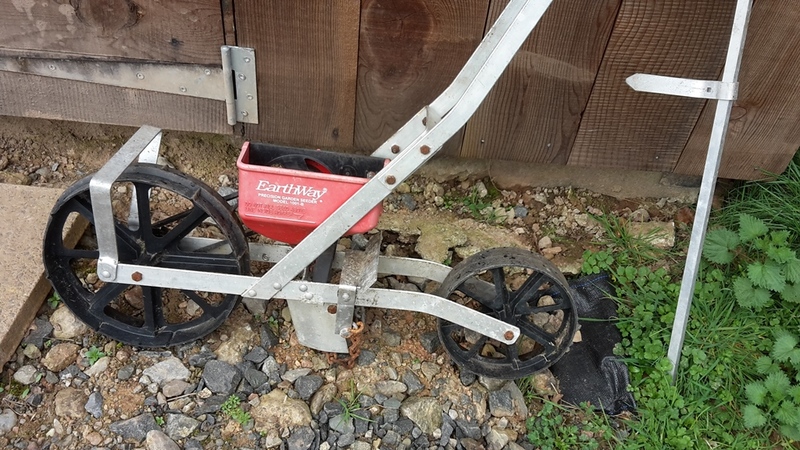 The only one that people really recommend in my budget is the Earthway seeder (there are many other better ones but out of my price range for now). I bought second hand, (around £40) but I had to buy the seed plates separately. Once they turned up I was desperate to try it. I got some old seed and ran through it, carrot and beet seed worked fine. Smaller seed not so much. In fact small round seed was terrible, unusable in fact. 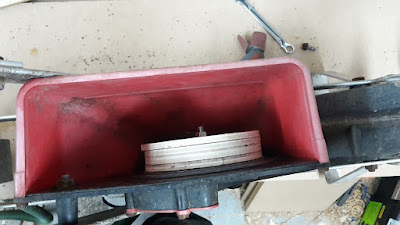 I was a little gutted, the seed would get behind the plastic plate and the hopper and then grind to a paste which would cause the plate to move further away and more seed to get in there. I was disappointed as I had ideas of plating mustard and turnips with it for fast catch crops. 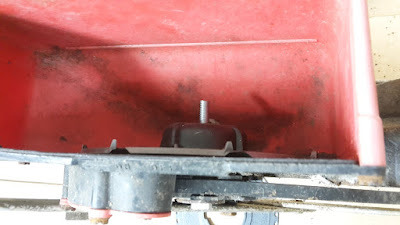 A quick search of the internet came up with a few answers, most involved buying a few bits, I decided to see if I could fix it with just a few scrapes in the workshop. I then cut out a few rings out of 1/2" and 1/4 ply to go over the plastic "nut" that holds the plates in place (I cut it with a jigsaw) and a circle to go over the top of them with a centre hole in to go over the newly lengthened bolt. 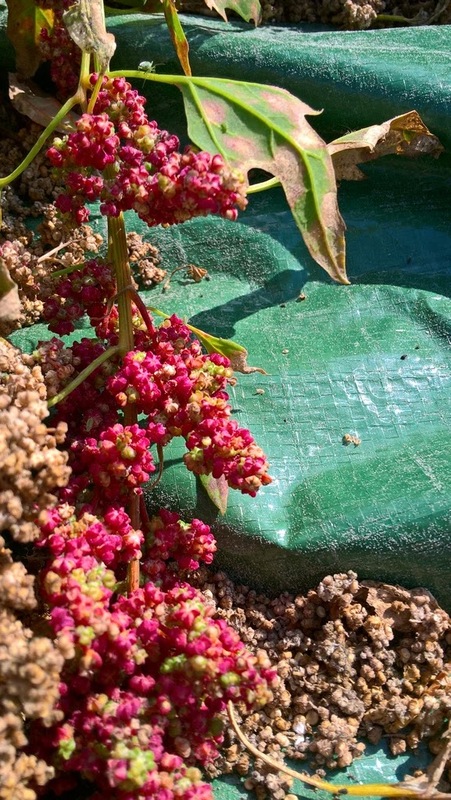 The outside diameter must obviously be less of a diameter than the seed holes on the plate! The three ply parts cut ready. The spreader plate in place doing it's job. 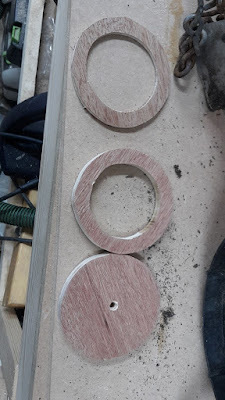 I then glued these up and left them to go off over night. 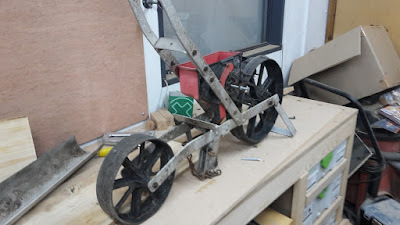 Now when I want to seed small seed all I have to do is fit the plate then add my spreader, put the nut on and tighten up a bit. the seed goes round perfectly and because the pressure on the plate is so much nearer the edge nothing gets stuck behind it anymore, it holds flat to the hopper. 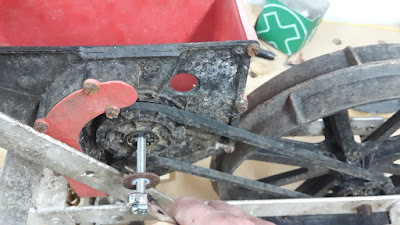 I will upgrade the nut with a wing nut welded to a washer once I get to my dads farm at the weekend and can borrow his welder for a few minutes, as that will remove the need for a spanner as well! 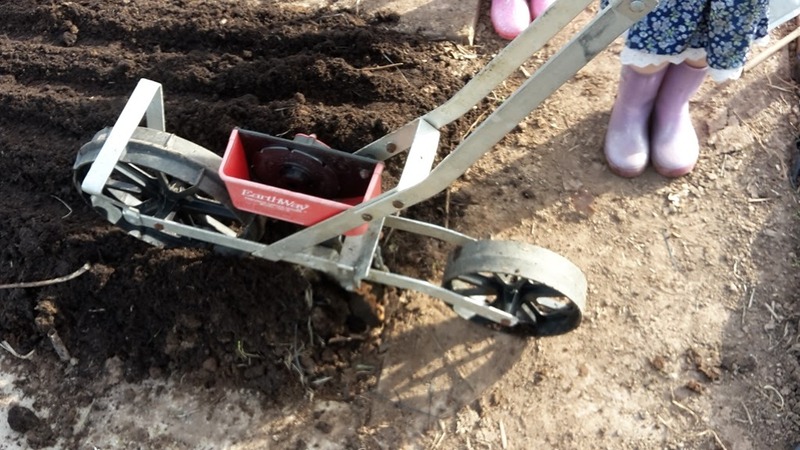 Do you use a seeder? What one would you recommend? 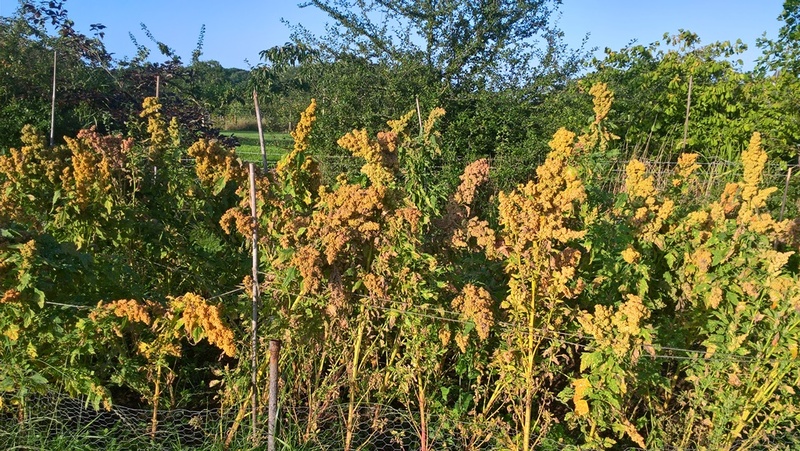 If you've read my previous post you'll know I've joined the Guild Of Oca Breeders to try help (in a small way) to develop a new food crop that is viable in the northern hemisphere. Friday night I managed to get the ones they'd sent me planted. 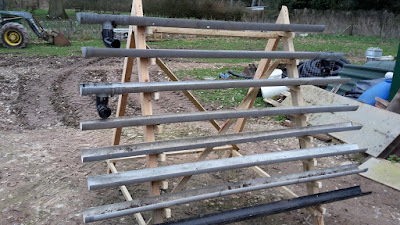 For the experiment I'm involved in they're meant to be started on the 21st of March but the weather wasn't favourable so a few days doesn't matter. 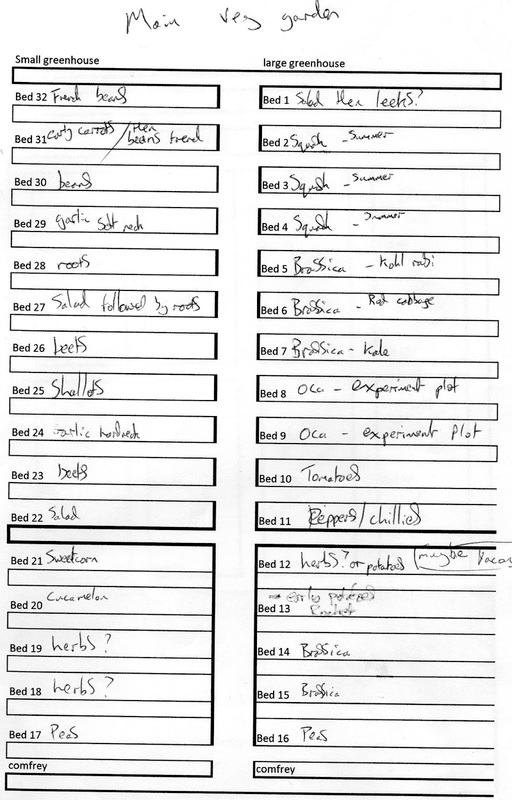 The three types above are for the destructive harvest experiment. 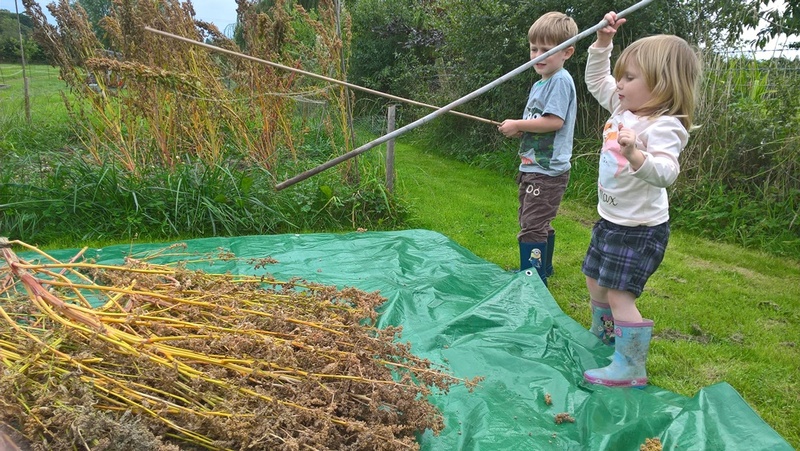 They're to be planted out and then one from each batch harvested and weighed on a set date, once a month starting in September and then yields can be compared to the length of day. I also got sent the observer pack with 12 genetically different types of New Zealand yam they've grown before. 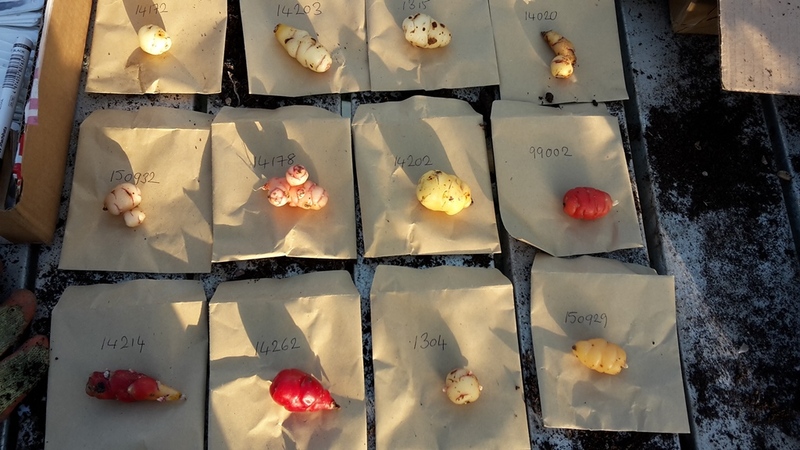 I loved the variation of the tubers with some great shapes and colours. 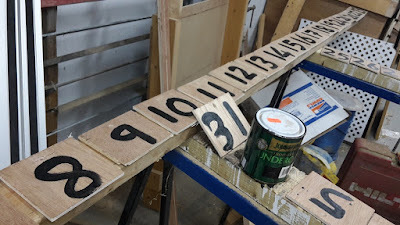 Each has it's own number so it's important to label them well encase any stock is wanted for future breeding or experiments. 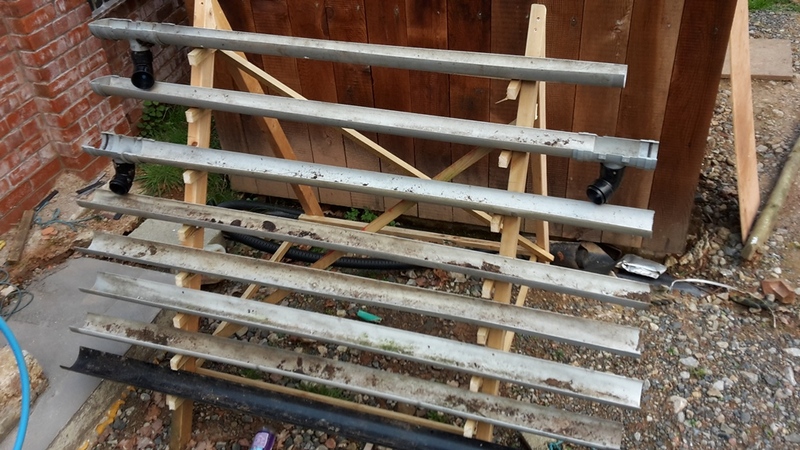 I've set a side what I think is quite a bit of space to grow these (four beds in fact) but compared to what some people are growing for the guild it's a very small amount! Should be interesting to see how they all compare. 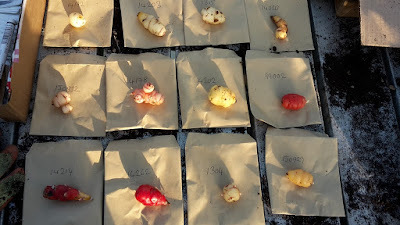 Who else is growing Oca this year? My daughter was so pleased with her packed lunch today and so were her teachers at nursery, they both asked for a piggy roll as well! 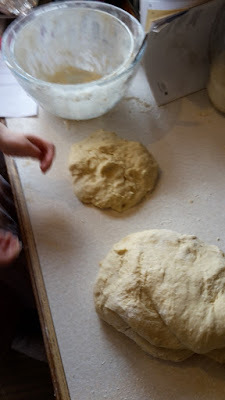 I got shown how to make this shaped bread on the bread course and I knew straight away that my daughters would love it (the boy is still too young but will happily shove it in his face). They didn't all turn out perfect, some were painfully disfigured uttering the words "eat me..." as they came out the oven but the rest look like a pig so I'll take that as a win! 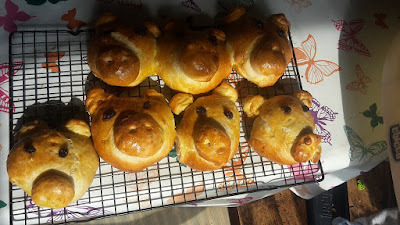 What other shaped rolls could I make for my children (and me!). Do you mess around with the shape you make your bread? I woke up this morning with a long list of jobs I wanted to get done, and although I didn't manage most of them I still feel that it was a really good day. It started off with my children giving my wife their cards and mothers day presents before texting my own mum (and speaking to her at a more sociable hour later). 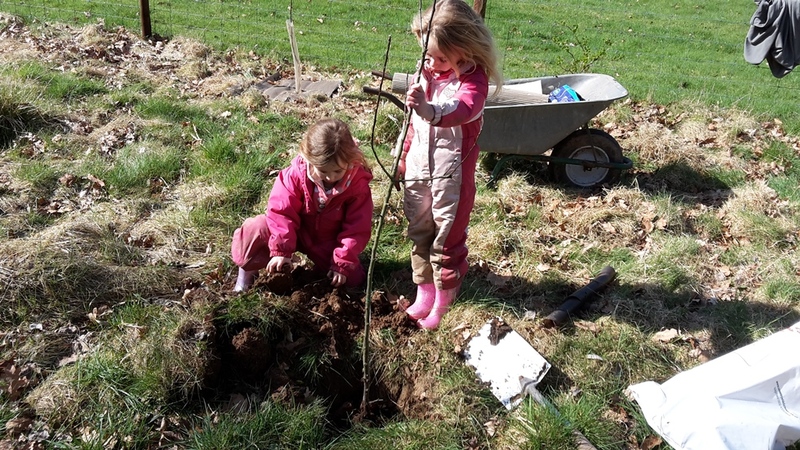 Then it was on to tree planting (my mum is coming round later in the week). I had a few trees left over from the ones I was selling and I didn't want them to go to waste, nor did I want to replant them only to lift them next year so I decide to plant them in our little coppice. 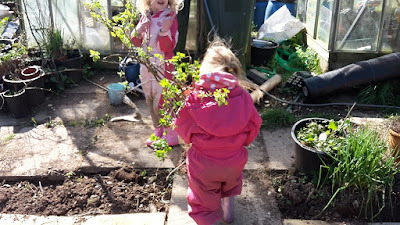 Reading Tracy's blog the other day, when she asked if you could ever have enough apple trees really spurred me into action - you can never have enough apple trees! 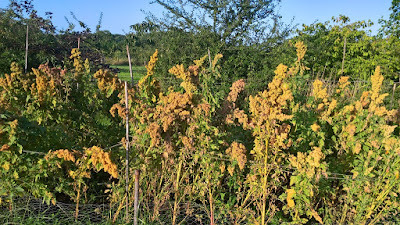 I thought that planted down the fence line they would be away from the willow I've got growing but also produce lots of food. I also like the idea of having two areas of apples away from each other so that if the frost catches one it might miss the other. 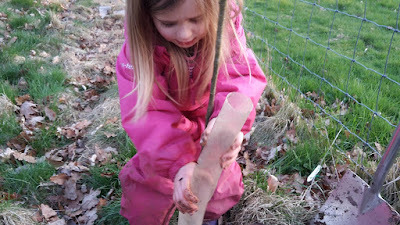 Good concentration putting the rabbit guard on! 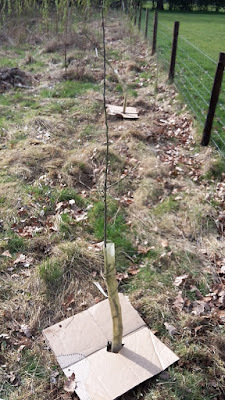 So armed with a spade, some BF&B (blood, fish and bone), compost (just a little for the bottom of the hole), tree guards, cardboard (to make a little mulch mat around the bottom of the tree) and a load of trees I set off over to the coppice. Trees planted with a cardboard mulch mat under it. The tree behind isn't exactly straight but who wants straight trees!??! 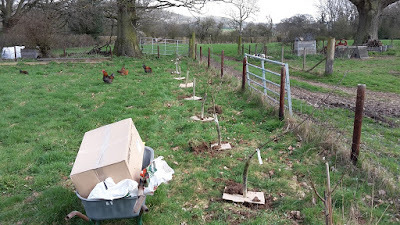 At the top of this area there is a foot path so I thought it best to plant the cider trees up this end - it might discourage scrumpers, you normally only eat a cider apple off the tree once! The lower half would have eating apples, mainly with a long storage capacity as I want to store more apples and it would mean that I could harvest lots of apples in one go then. I went over on my own to start with, dug all the holes (the boring bit) and then went and got my pair of helpers, they love planting trees and needed no convincing to come and help me. They're very good and take it in turns with the different jobs. 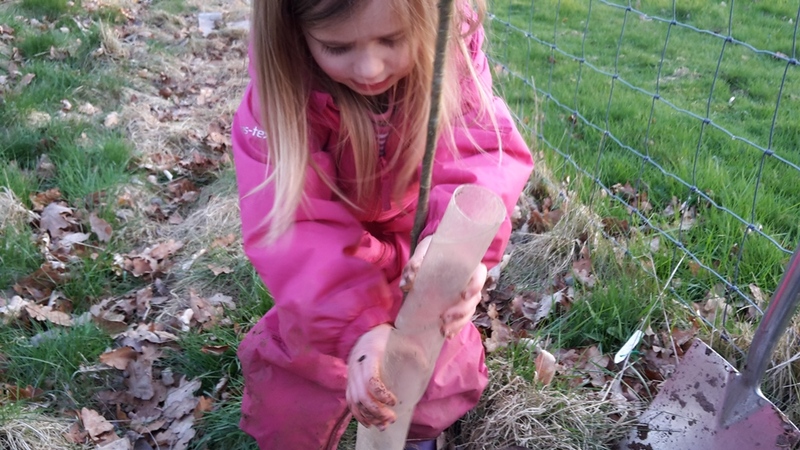 We also stopped lots of times to watch ants, worms and figure out what lived in a hole in a big old perry pear tree in the hedge. One holes the tree while the other puts the soil back in the hole. 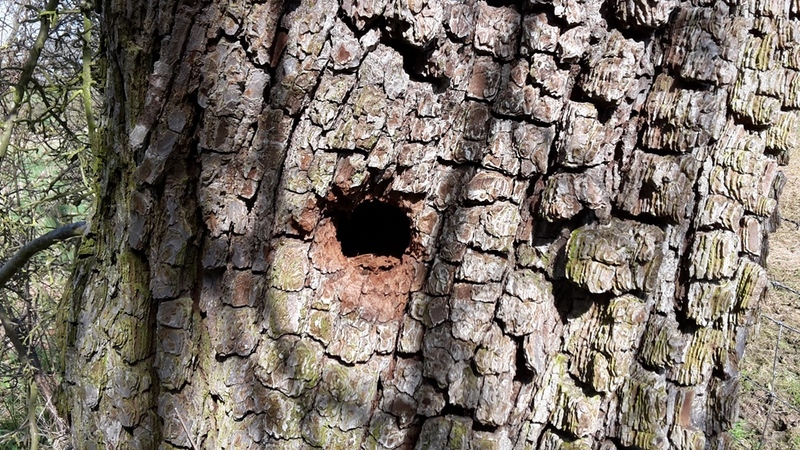 We did spend a bit of time trying to decide who lived in this hole! 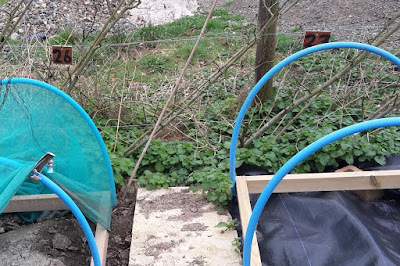 Eaters planted this side and cider apples nearer the footpath (behind this picture) - should put off scrumpers! Once we'd finished that area and had some lunch I got back to planting. 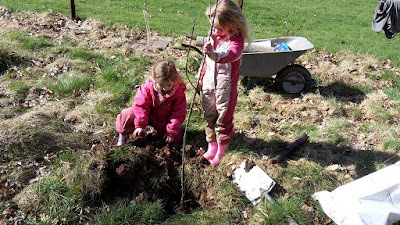 Five cherry trees planted and two apricots. The orchard at the bottom of the garden is only half full at the moment as it's handy to have somewhere I can park large diggers and things, but last year I did plant a cherry tree near the fence line. 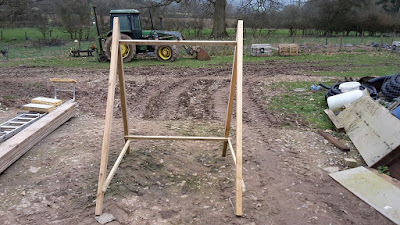 I decided to increase this and plant another five cherry trees and a couple of apricots, they're all on dwarf root stocks so I'm hoping that netting a short row like this won't be too difficult in the future. We love cherries! In total we planted another 12 apple trees, two pears, five cherries, two apricots and a gooseberry bush. The funniest question people ask me about my apple trees is what am I going to do with "all those apples"? In a good year we'll eat loads, store loads, make juice, dry them, can them, make cider, add them to jams and chutneys and give away or sell the surplus. In a bad year we'll have just enough to get by, hopefully! What about you? 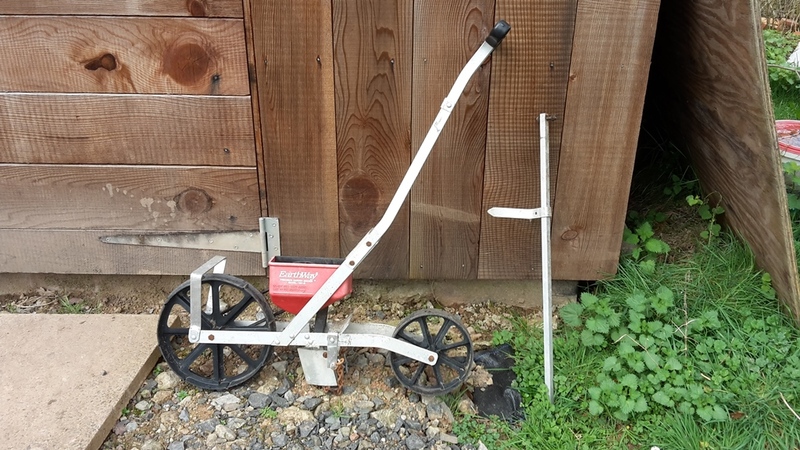 Have you planted enough to allow for bad years as well as good if you've got the space? 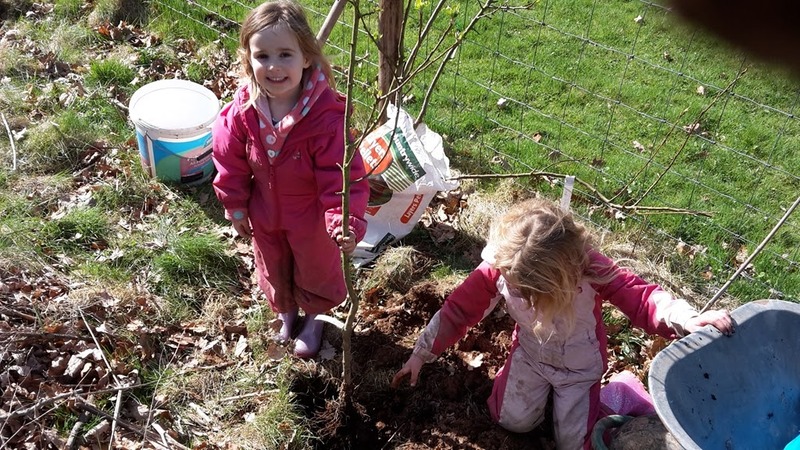 What would be your fruit of choice to plant in your area or your dream location? On Thursday we were confined to the house really. The weather was rubbish and my eldest was poorly. So I decided to keep my middle one entertained we'd make some rolls. After a trip to an amazing burger joint a few weeks ago I'd got a hankering for some brioche buns to make some epic burgers and I'd been given a recipe I wanted to try. 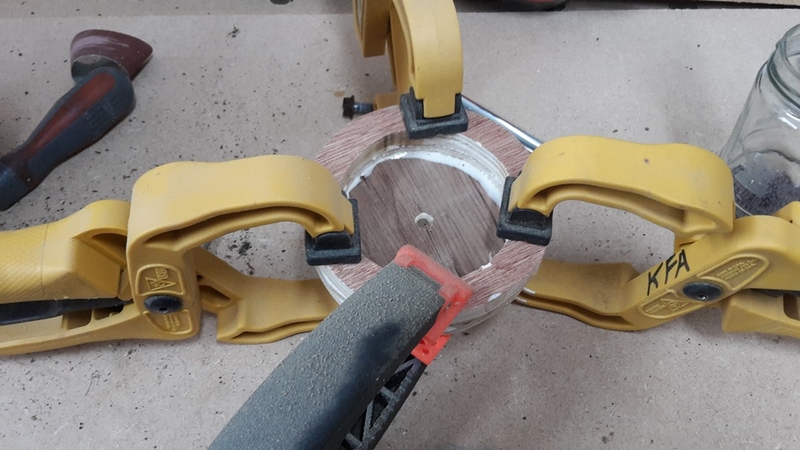 I did make one fairly large mistake at the beginning. I didn't pay attention to the amount I was making. 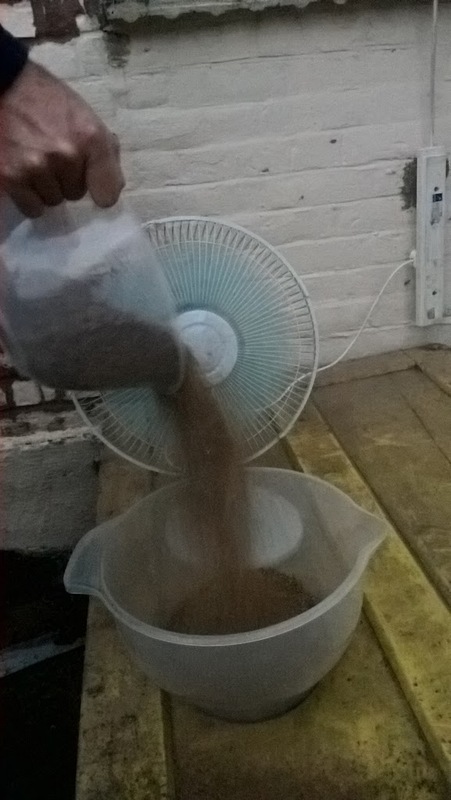 I made the flying sponge (the bit that gets the yeast working early on) and thought, wow that's quite a bit to make. Turns out when I started to look at the other ingredients I was looking at bakery quantities. Turns out I made enough for 4 dozen rolls! My biggest problem was not having a mixing bowl big enough! In the end we used my big preserving pan. You can see in the video above how near to the top that was. 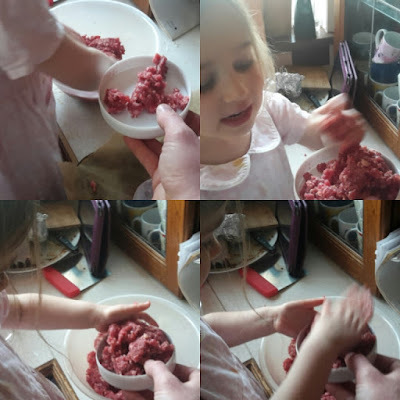 It makes me laugh when parents set out "messy activities" for their kids, just make them work for their food, they'll get messy in the process! So after an hour we added the flying sponge to all the other ingredients and luckily for me I had a really good little helper who was keen to mix the mixture and then knead the dough. 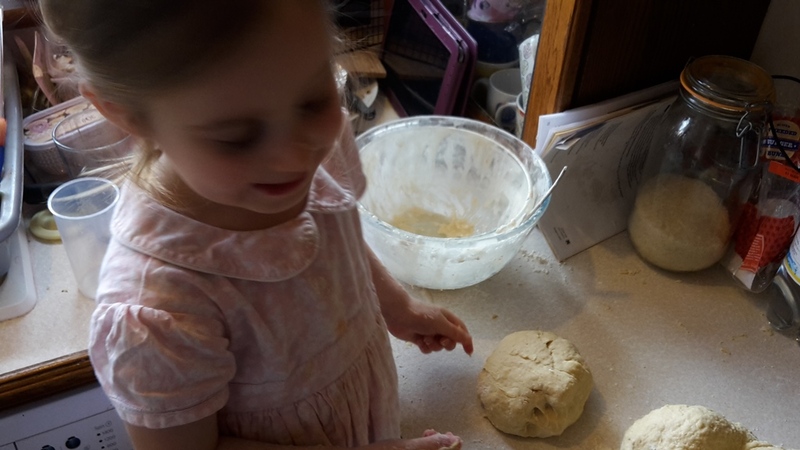 I gave her about 1/5 of the dough and she kneaded right through to where it needed to be, I didn't help her at all but you could tell she'd done it enough because the dough started to look smooth and just felt right. I was impressed with her because she's only three and she stuck at it for well over half an hour and didn't moan once . 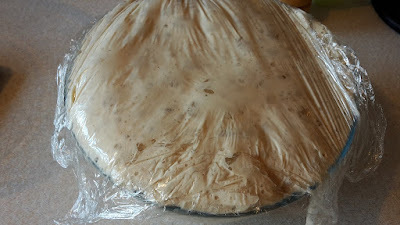 I split the dough into two big bits and worked it at the same time. Sometimes I'd slap it down on her hands and she's laugh her head off! 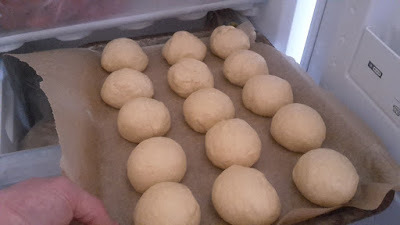 It then rested for 45 minutes and I set about making it into rolls. A great tip I learnt on the bread making course was to weigh out the rolls so they're the same size, it doesn't take long and it's much better if they're uniform. 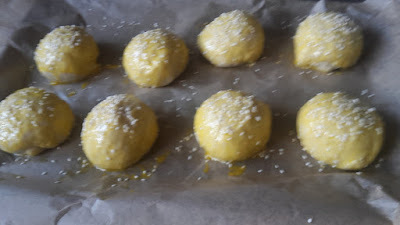 I rolled these out and set them on baking trays. Most went into the freezer like this and were then put into freezer bags to be enjoyed at a BBQ in the near future (hopefully!). I kept eight back for tea, covered them with an egg glaze and sesame seeds before leaving them to prove and cooking them. 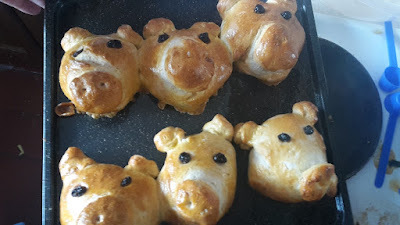 They looked amazing when cooked! 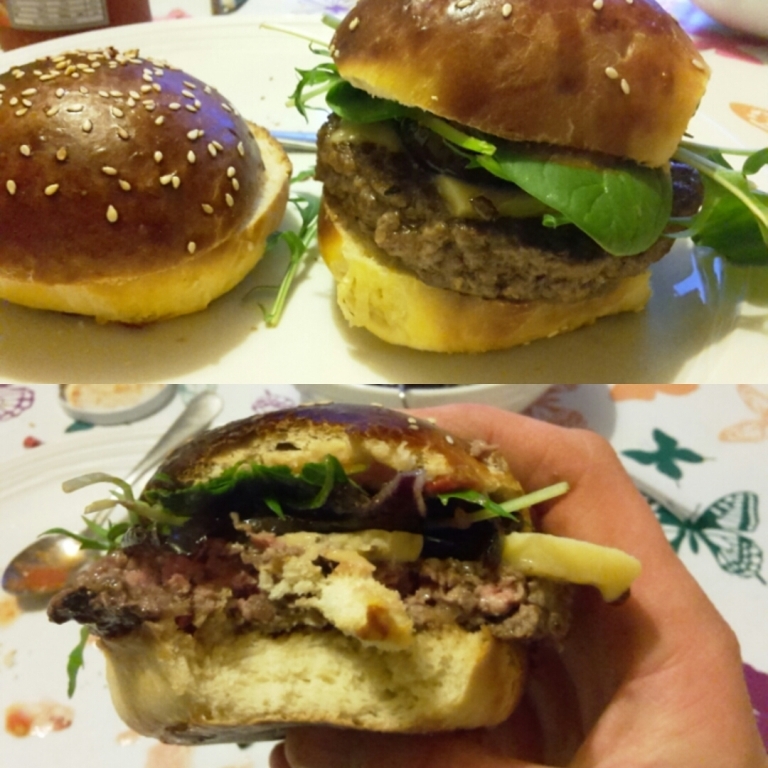 So we couldn't have homemade buns with out homemade burgers so we got some beef I minced last year out of the freezer and made up 1/4 lb patties with a burger mould I've got. My little girls didn't mind this at all and was straight in there making them all for us! Just beef in the patties and seasoned before I cooked them in a hot pan. I cooked them medium so they were still juicy and I have to blow my own trumpet and say they were amazing. 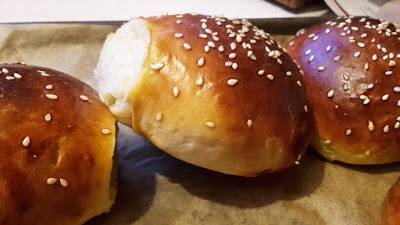 I'm not normally a fan of something sweet with savoury but these buns are only ever so slightly sweet and really work with the meat. 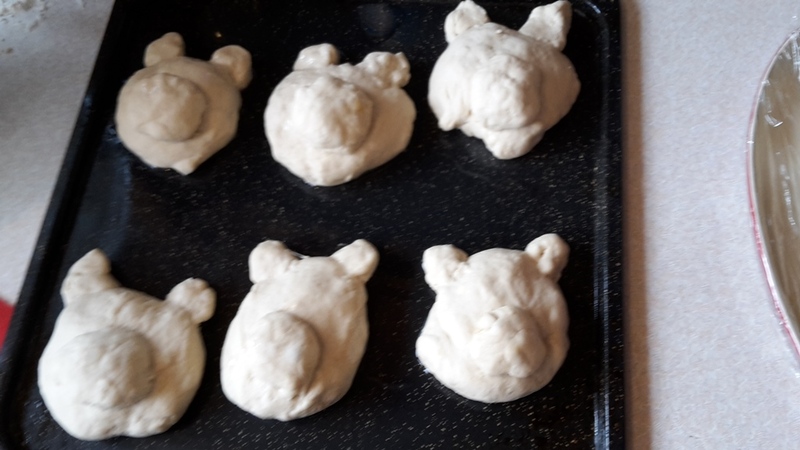 Anyone else make burger buns like these? 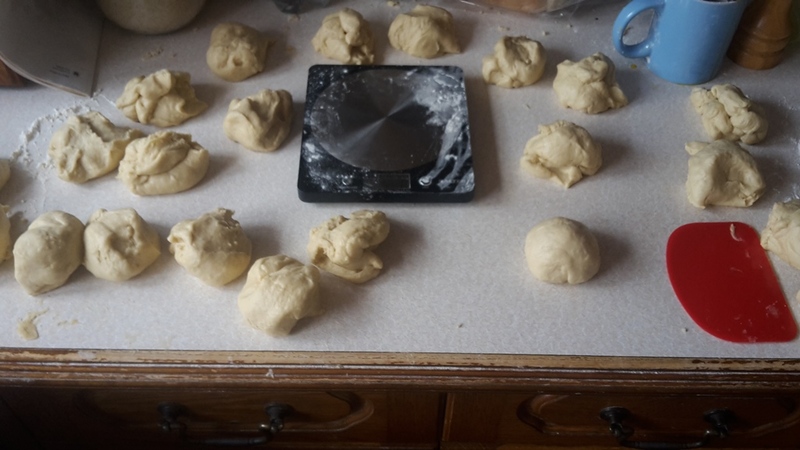 Anyone ever started a recipe and realised that the quantities were huge and made far too many? This is subject to change! You can see a previous years planting plan here. The greenhouses are used for starting seeds and transplants earlier in the year then for tomatoes, chillies and cucumbers later in the year. 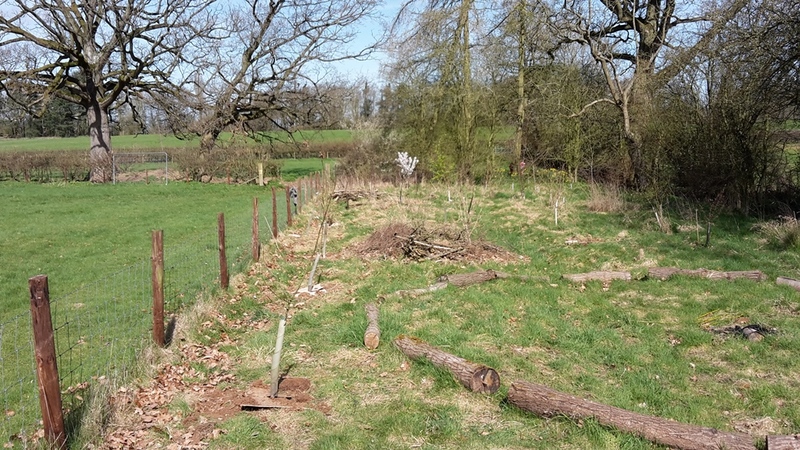 The left hand side of the garden also has 30 something cordon apple trees as a fence between the garden and the field. 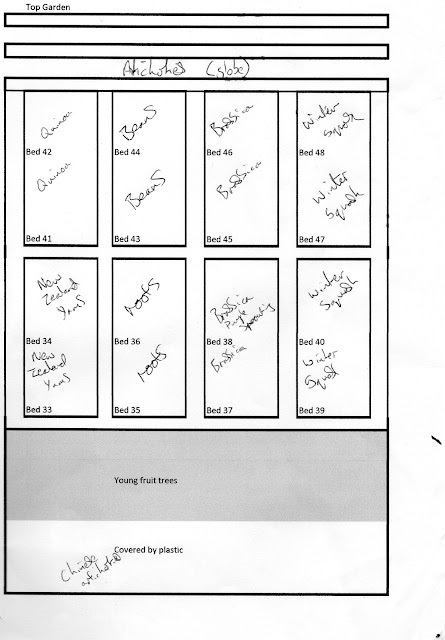 The way I'm setting out the "main garden" means that on many plots I'll be able to get two crops out of some beds. 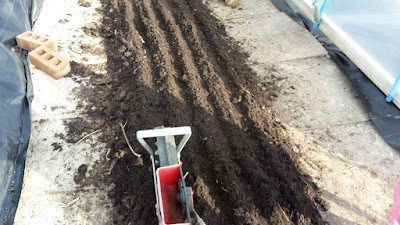 Things like squashes won't go in until late may/early June, so I might get some baby leaf salad in there first and then things like garlic that are harvested quite early will have a crop following them, like beetroot or carrots. 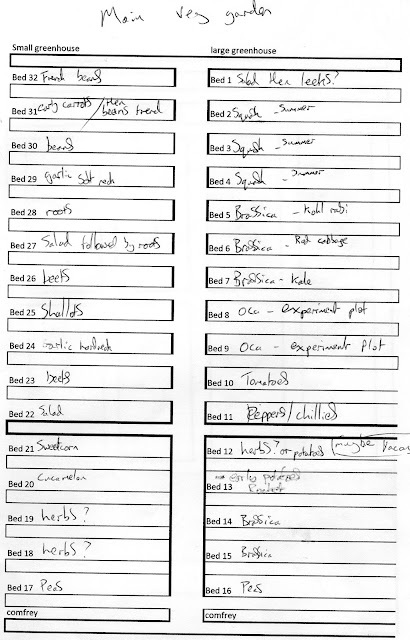 Having 32 beds and many plant families should make rotation easier in future, although some of the main crops you always want to grow more of. Having a few beds of annual herbs and lettuce in here should make rotation more flexible as well. I will be growing some of these through plastic, the idea is to not leave the soil bare and try to make it manageable for one man with some small people helpers to keep on top of! 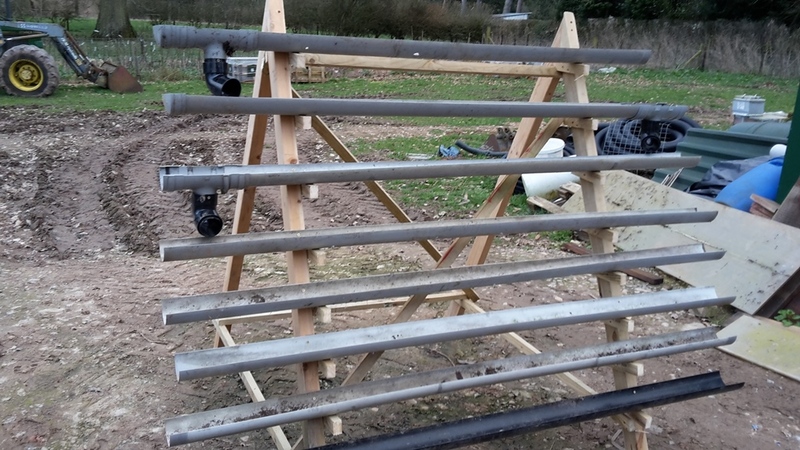 The second garden has it's beds laid out double, so each one is 20ft x 30" (6m x 750mm) and will contain crops that require less input from me. 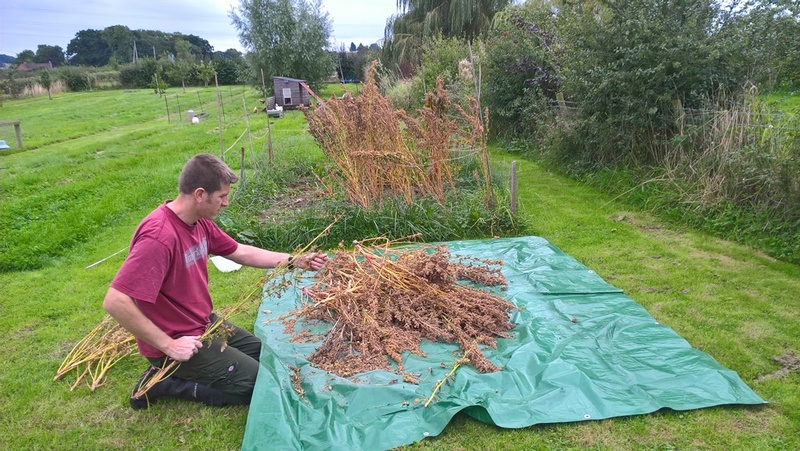 That means things that can be harvested in one go, like winter squash, quinoa for grain and winter brassicas that don't need much attention during the summer when I'm really busy, like purple sprouting, cabbages and sprouts, hopefully no watering will be needed up there either! There are other areas that I will be planting up around the place. The area below my young fruit trees will end up with something in there (currently a small patch of Chinese artichokes that I forgot to harvest and try!) and I have some raised beds at the end of the main garden covered in weeds, so I might clear them out at some point to plant something. There is also two beds at the top, one is full of day lilies and the other is going to be planted with globe artichokes. 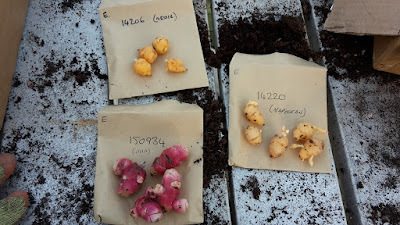 My key aims are to record what I do this year so I have a record of area planted and yield gained as well as the days it took from planting to harvest (days to maturity). But to eat as much as we want and to try and sell the surplus. I'm also making a real effort with seed saving as I have been given some seeds to try to preserve so areas or beds will be set aside for that later in the year. 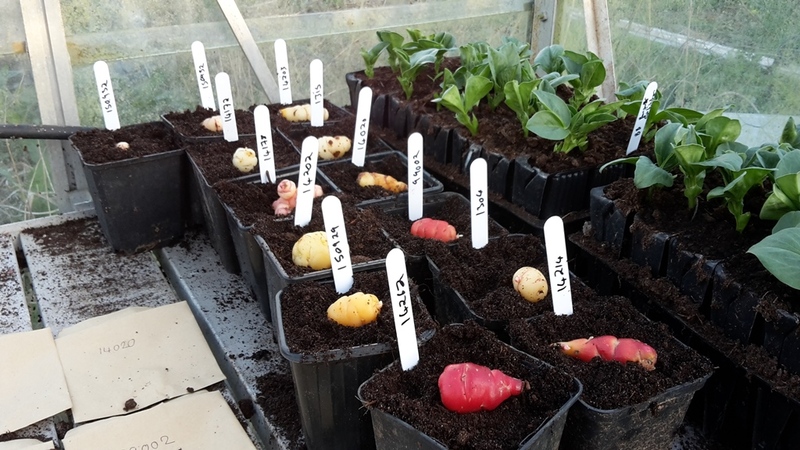 I'm hoping a more systematic approach will bring food self sufficiency that little bit closer but I'm sure it will all go to pot in a few months and I'll have weeds round my eyeballs and a glut of things I can't preserve! Do you like my veg plan or is it too formulaic for you? Show me your planting plan! In any industry, profession or hobby there is a lot of terminology or buzzwords and in the world of gardening and self sufficiency there is more than a few to describe what you can do. And I fit somewhere in there. Some I certainly don't do (double dig or bio-dynamic) and many I certainly do! I'm not sure where I am on that list but I certainly don't like to put a label on my gardening "style" as then I feel I can't experiment or mess around with other methods. My current method of gardening would best be described as "an organic approach that used no dig or minimum tillage (or though I occasionally dig over a plot completely) , whilst practising some aspects of permaculture when it comes to fruit and trees, some of sustainable and regenerative agriculture, but with many annual veg with a bio-intensive spacing utilising plasticulture to suppress weeds where necessary. Actually I think what I'm trying to say is it's best not to label the type of gardening you do as you might end up restricting yourself. Do what works, try something new every year and keep experimenting to keep it interesting. 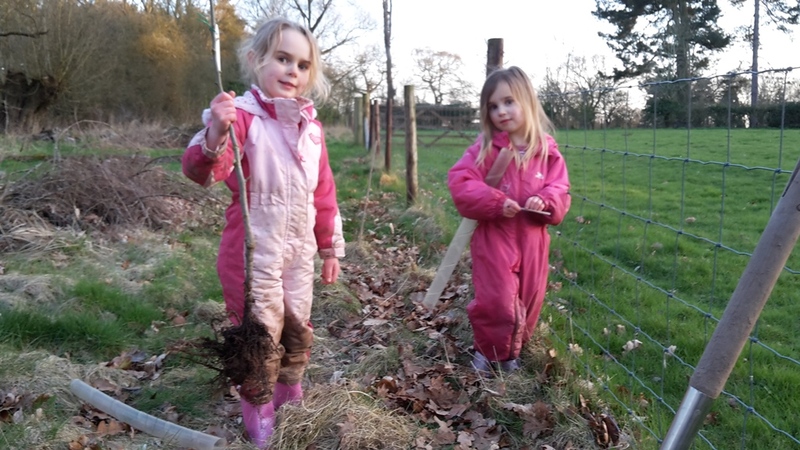 Just make sure you look after the soil and the rest looks after itself. What buzzwords would you add to that list? What over the top way could you use to describe your current gardening methods? The garden is probably at the only stage in the year where it looks remotely organised. Beds are laid out, some of last years crops are still in the ground to be harvested and new ones are nearly ready to be planted. 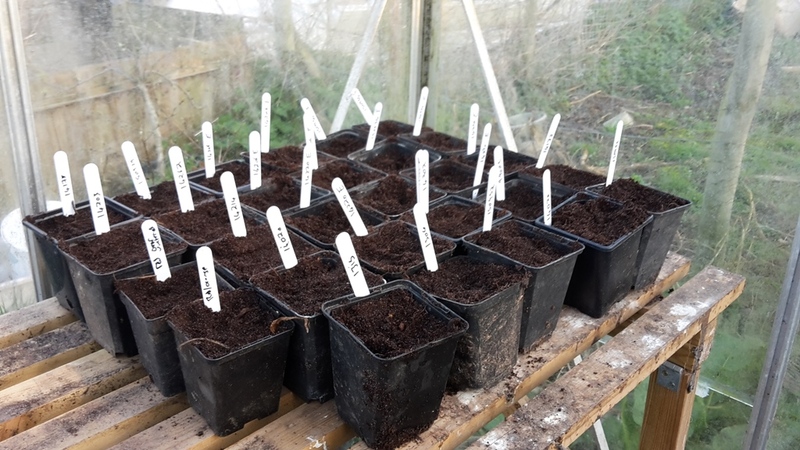 As I've got quite a large number of beds laid out this year, I've decided to make sure they're numbered. That way I can easily keep records in my diary of what is planted where and I can also say to my wife that she can pick veg from ## bed if I'm not cooking that night. I made the number tags from some off cuts of 6mm (1/4") ply, I painted the numbers on with some black oil based paint and then coated both sides of the tags with boiled linseed oil to give them a bit of protection from the weather. I then went and tied these round the garden and realised that the planting plan I'd already drawn up (on the computer luckily) was the wrong way round so needed changing, that's why I've not shared it with you all yet! 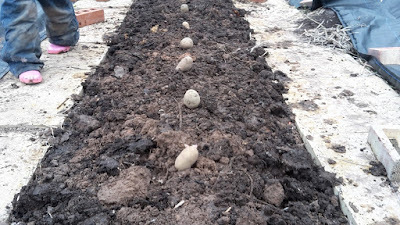 The girls and I managed to plant some potatoes today as well, it's a nice first early variety called rocket which will be good with a salad, I know it's still early but I plan to use one of my hooped frames covered with plastic to make a mini polytunnel. Only one bed planted with them so far - bed 13 - unlucky for some! Who else numbers their veg beds like this? Anyone else got their spuds in yet? I'm rubbish at growing strawberries. I can grow most things but strawberries somehow never work for me. Now I can keep the plants alive and healthy but somehow I always end up feeding something else, either mice, birds or slugs. I've tried netting them, and growing them in different ways, I've had some success with white alpine strawberries but I always thought I could do a lot better. 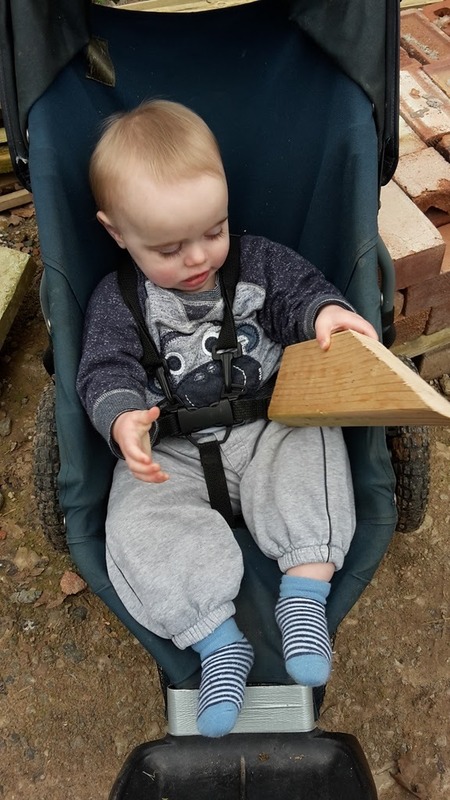 So on Thursday my mum came over to help look after the children while I got on with some jobs. 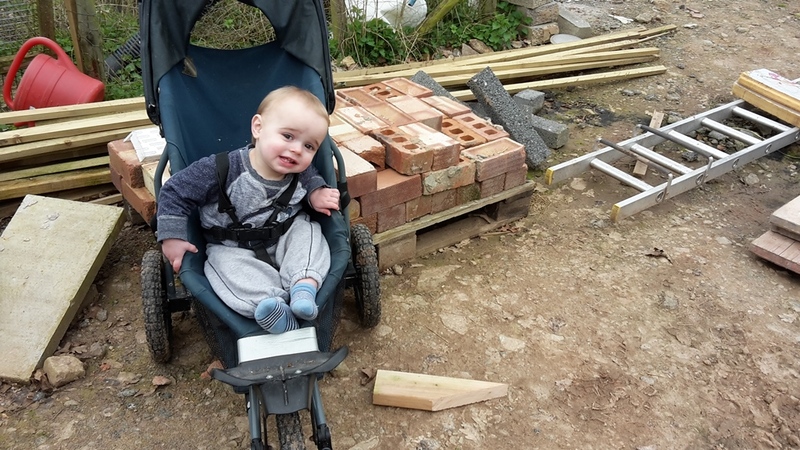 The boy, however, wasn't playing ball and was being quite a daddies boy, no chance of working on the extension so I decided to tackle a little project I'd been thinking of for ages. I took the boy with me and made the project outside with him watching me from the pushchair, he was as good as gold and laughed every time I drilled or made a loud noise! The planter in place but it will be moved soon. 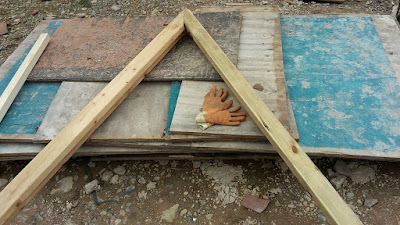 For the last few years when I've been doing roofs for customers houses I've been saving the old gutter with this project in mind. Although the guttering isn't that deep I'm only going to grow alpine strawberries in this as a test project. 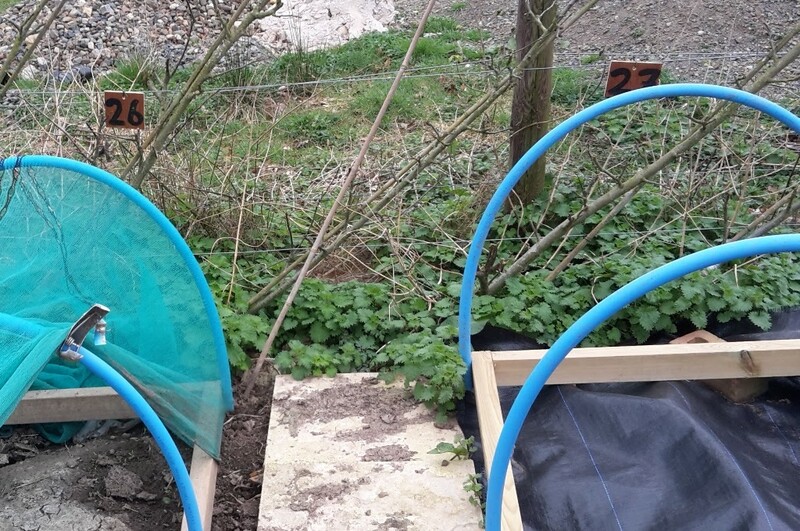 I've positioned them in a area by a shed and a wall so they should have a really warm little micro climate. I've made this frame movable at the moment as the area under it is going to be slabbed, but if it works I might fix it back to the shed and remove the rear support, making it much smaller. 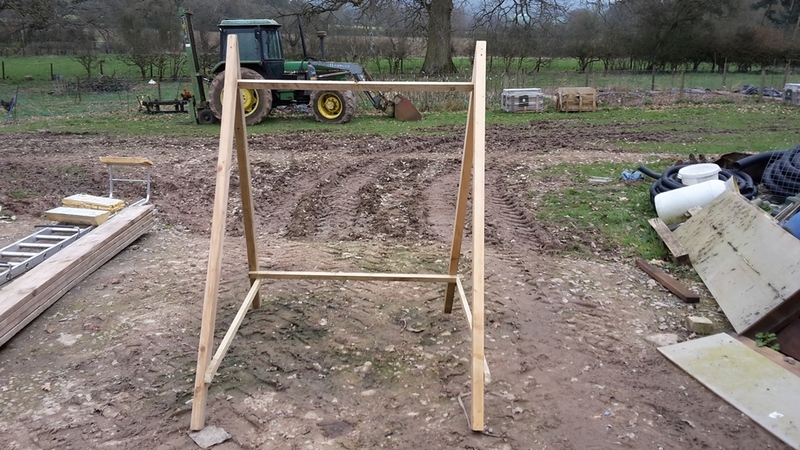 The frame should be really easy to net and I have plans to use a solar pump to push water to the top of the frame and let it filter back down - hopefully this will work! I grew a big batch of alpines strawberries from seed last year and I'll post another picture when this is all planted up (I've got to make some stop ends for it as well yet). This could easily be used for salads as well. Anyone else grow vertically and have any success?